Calamus maturbongsii W.J.Baker & J.Dransf. Moderately robust, clustering rattan climbing to 30 m. Stem with sheaths 16 – 22 mm diam., without sheaths to 10 – 11 mm diam. ; internodes c. 48 cm. 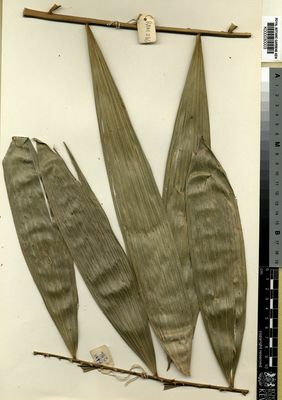 Leaf ecirrate, to 1 m long including petiole; sheaths with very thin, white, cobweb-like indumentum, unarmed or armed with very few, scattered, minute, easily detached, triangular spines to 1 mm; knee 13 – 22 × 16 – 21 mm, unarmed, with conspicuous ridge at the base, both ends of ridge somewhat deflexed; ocrea 3 – 5 mm, forming a low collar almost entirely encircling stem, persistent, drying woody, brittle, unarmed; flagellum to 1.7 m, with numerous grapnel spines arranged subregularly to irregularly; petiole 3 – 5 mm long, 6 – 11 × 3 – 6 mm at base, flat adaxially, rounded abaxially, unarmed; rachis with grapnel spines arranged subregularly, abaxial surface with indumentum as sheath, adaxial surface with numerous dark purple-brown scales; leaflets 7 – 12 each side of rachis, arranged regularly, lanceolate with cucullate apices, longest leaflet near leaf base 26 – 36 × 4.5 – 5 cm, the basal pair of leaflets almost as large as longest leaflets, mid-leaf leaflets 24.5 – 26 × 4.3 – 5.5 cm, apical leaflets 5.5 – 12 × 0.7 – 2 cm, apical leaflet pair not united or united to one quarter of their length, leaflets glabrous and unarmed or with exceedingly few bristles on margin or tip, transverse veinlets conspicuous. Staminate inflorescence not seen. Staminate flowers not seen. Pistillate inflorescence 62 – 81 cm long including 33 – 46 cm peduncle and 5 – 14 cm tip lacking primary branches, branched to 2 orders; prophyll 36 × 0.6 – 2 cm, with triangular limb at apex, not splitting, with indumentum as sheath, unarmed, prophyll and other primary bracts strongly overlapping; peduncular bract 1, c. 17.5 × 1.5 cm, similar to prophyll, but splitting to one half of its length, with indumentum as sheath, unarmed; rachis bracts 6 – 16.5 × 0.6 – 2 cm, similar to peduncular bract, but splitting to base and tattering due to emergence of primary branches, sometimes splitting on one side of inflorescence only, otherwise splitting irregularly, with indumentum as sheath, unarmed; primary branches 3 – 7, to 7 cm long, 3 – 6.5 cm apart, only briefly adnate to inflorescence axis above subtending bracts, straight and forming narrowly acute angle with inflorescence axis, rather congested, with up to 17 rachillae, bracts unarmed, primary branch and bracts with indumentum as rachillae; rachillae 3 – 20 × 1 mm, straight and forming acute angle with primary branch; rachilla bracts 1 × 1 mm, subdistichous, with dark indumentum and narrow brown scales; proximal floral bracteole 1 × 0.75 mm, distal floral bracteole 2 × 2 mm, triangular, scar of sterile staminate flower inconspicuous. Pistillate flowers 4.5 × 3.5 mm shortly after anthesis, available material somewhat decayed; calyx 3.5 mm diam., tubular in basal 3 mm, with 3 lobes to 0.75 × 1.5 mm, glabrous; corolla 2.75 mm, with 3 lobes; staminodes 6. Fruit subspherical to broadly ellipsoid, 15 × 12 mm including beak 0.5 mm, with 15 – 17 longitudinal rows of orange, scarcely channelled scales with finely erose margins. Seed (sarcotesta removed) 9 × 8 × 5 mm, globose, compressed, with a deep pit on one side, with a small, rounded appendage at apex; endosperm homogeneous; embryo basal. Lowland forest from 100–200 m.